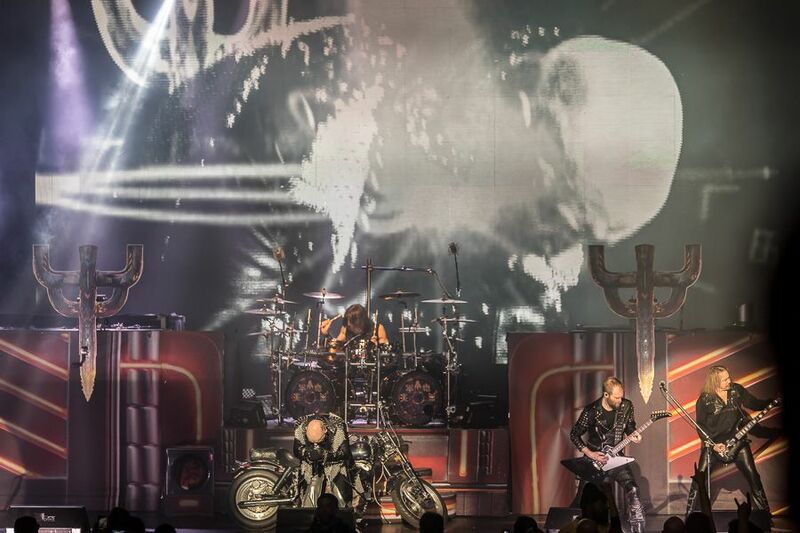 Judas Priest unleashed the Metal Gods with merciless firepower for a house full of metal maniacs at the Masonic Temple in Detroit. 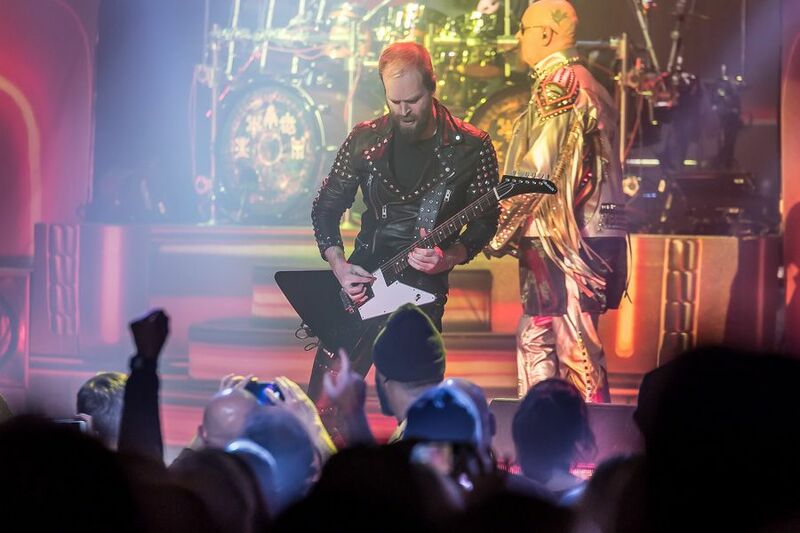 A hungry host of metal fans fill the Masonic Temple in Detroit to worship at the heavy metal alter with Judas Priest. 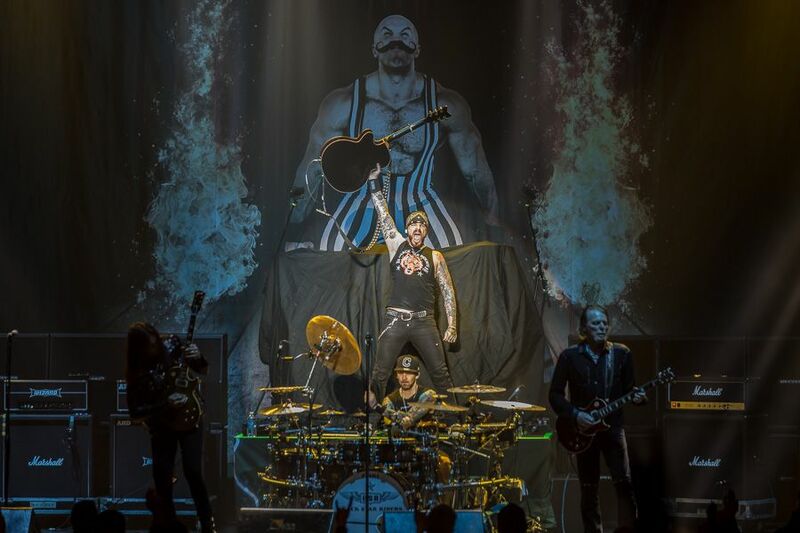 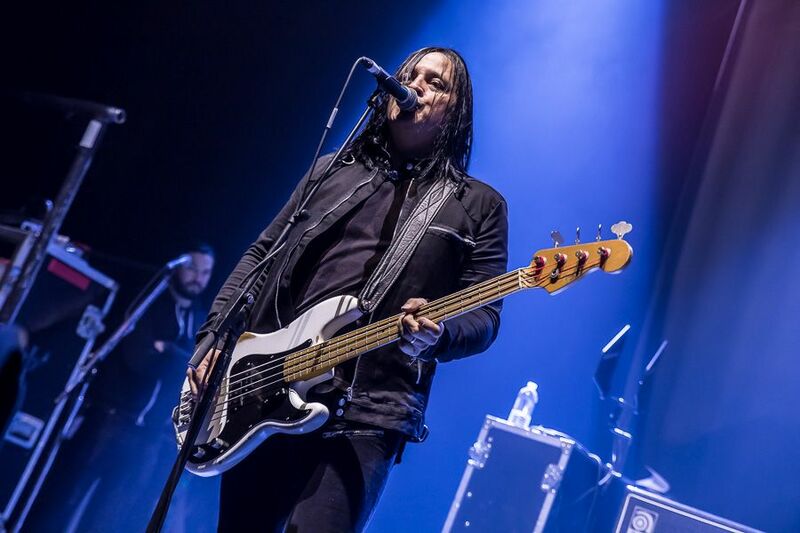 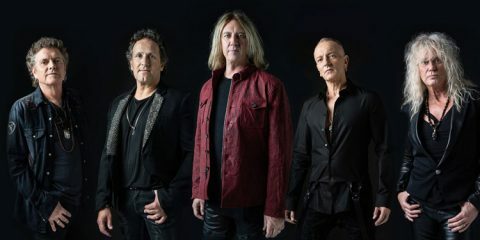 The Priest are back in North America to support their new album called Firepower which has met with a boatload of praise from fans and critics alike. 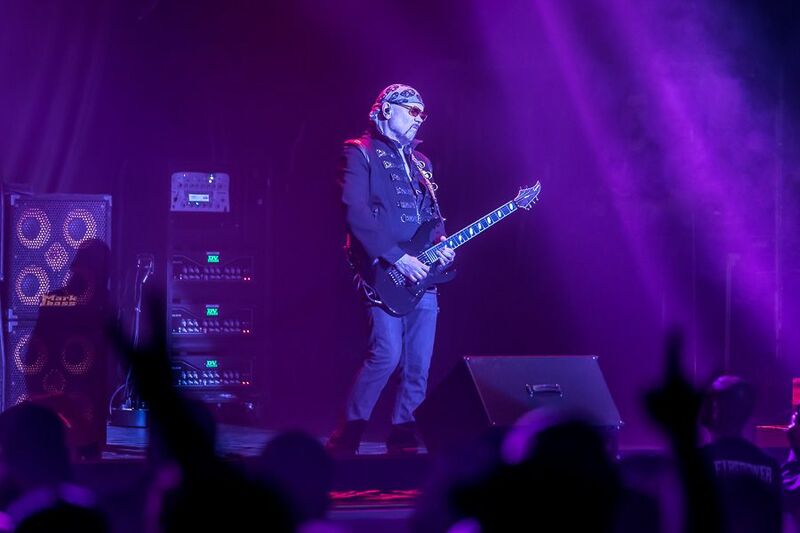 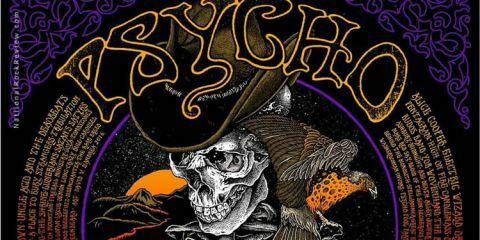 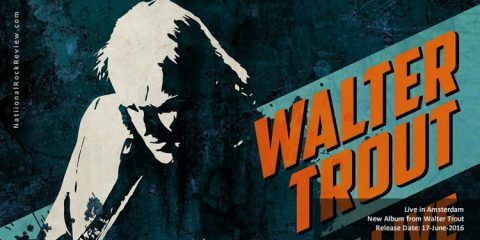 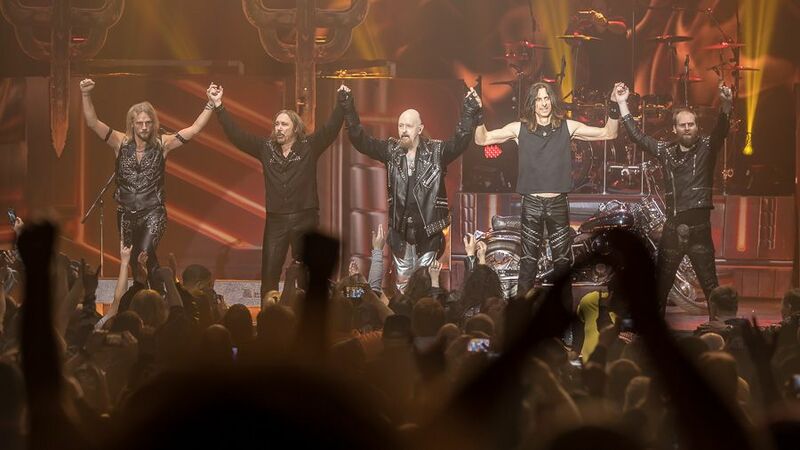 While legendary guitarist Glenn Tipton cannot make the show due to his battle with Parkinson’s Disease, fans are eager to show support for a band that continues to deliver the goods. 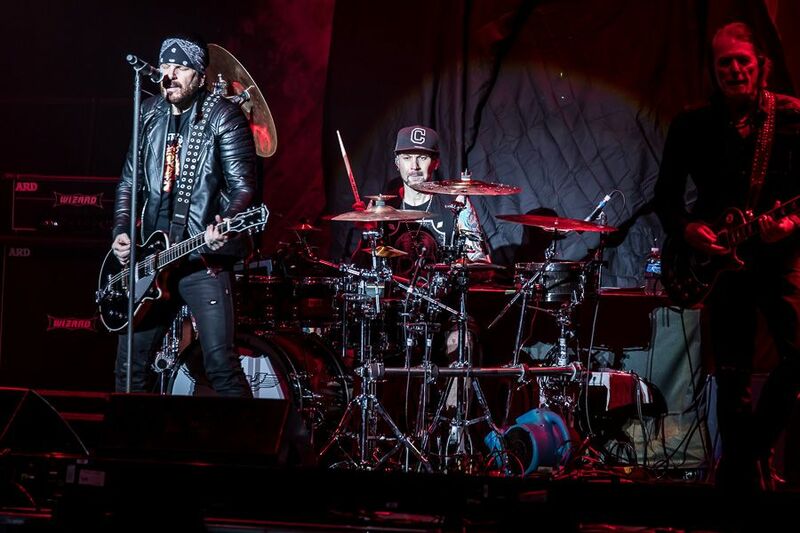 Getting the party started is Black Star Riders. 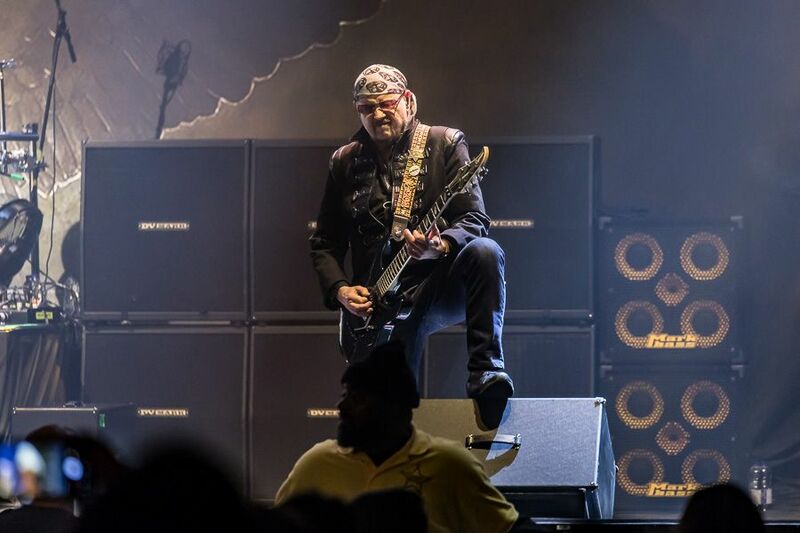 Ricky Warwick (vocals/guitars) channels the fighting spirit of Phil Lynott as the band breaks into the title track from their first album “All Hell Breaks Loose” before punching things up with the Thin Lizzy classic “Jailbreak”. 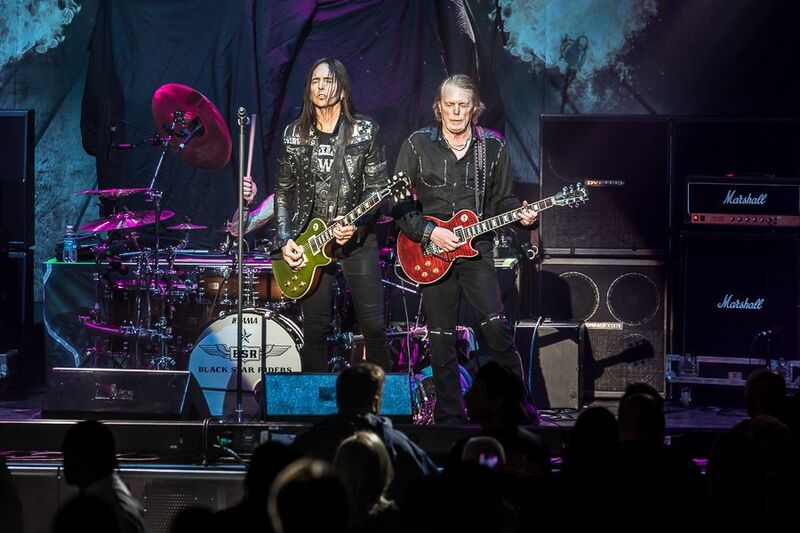 Guitarists Scott Gorham and Damon Johnson trade licks on anthem rockers “Heavy Fire” and “The Killer Instinct” with Chad Szeliga (drums) and Robbie Crane (bass) keeping the groove locked in tight. 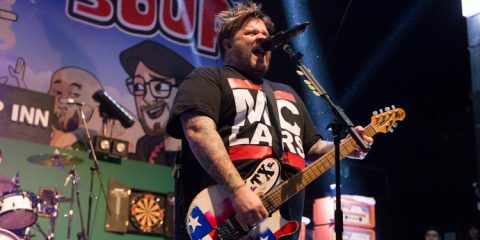 Great music to raise a beer and shout at the top of your lungs. 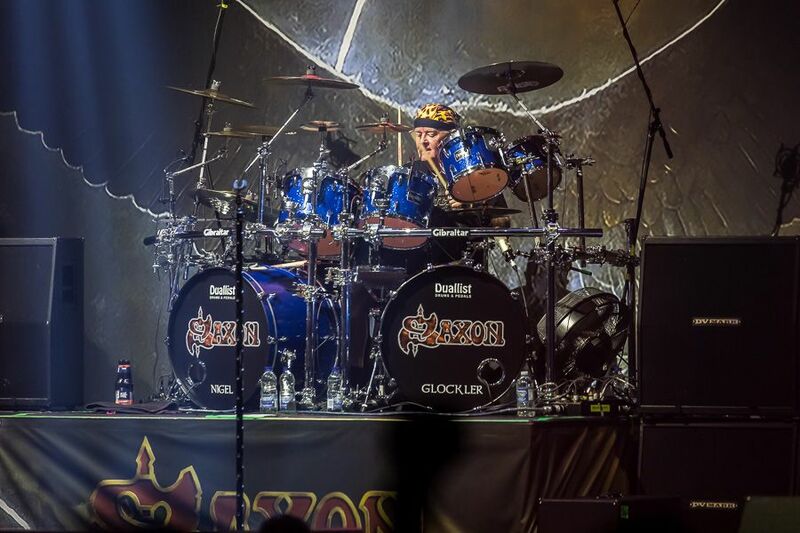 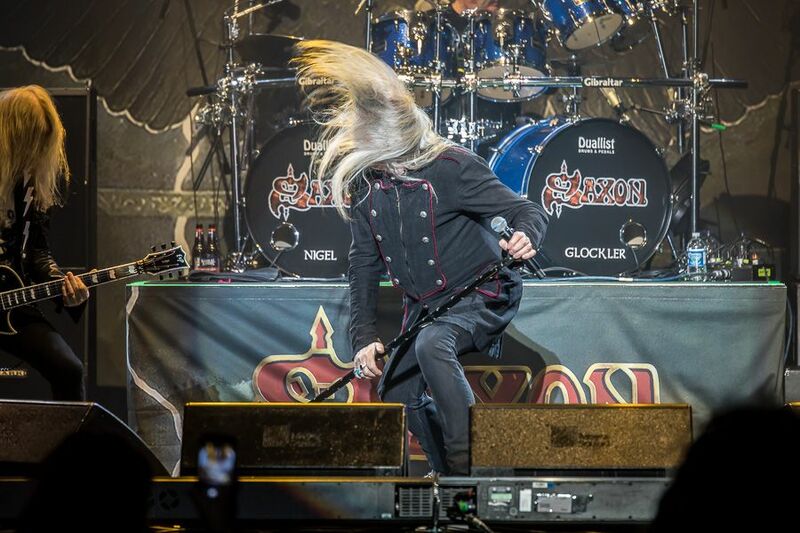 The cheers soar as the intro “Olympus Rising” signals the advance of Saxon to the stage. 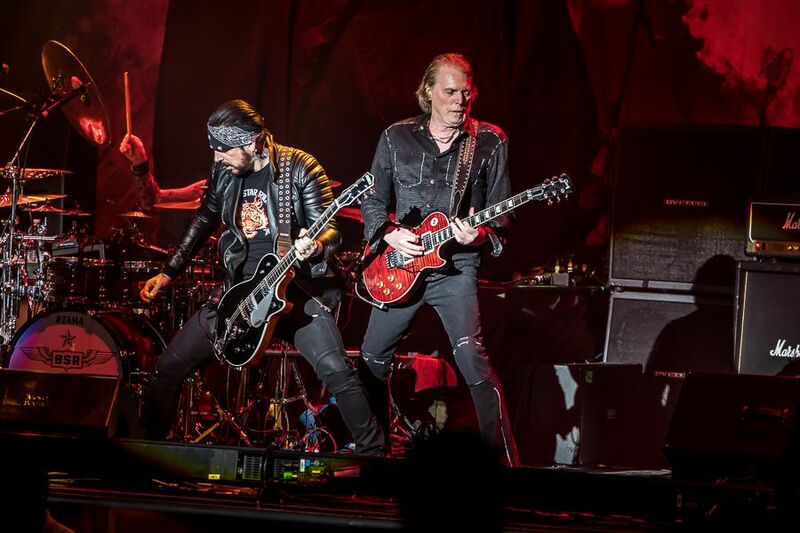 The band tears into action with the title track from their new album Thunderbolt. 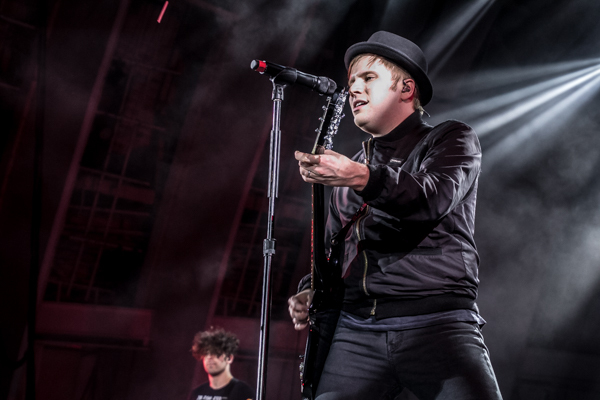 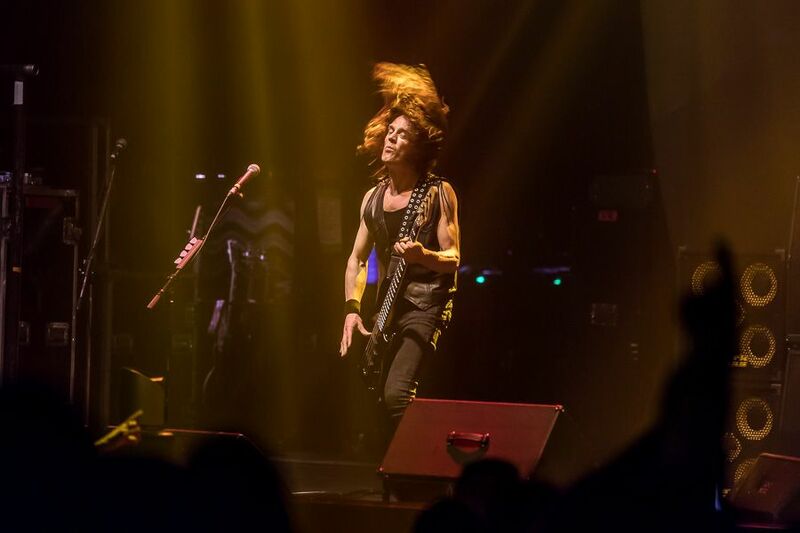 This is heavy metal at its best as the band headbangs along with the audience. 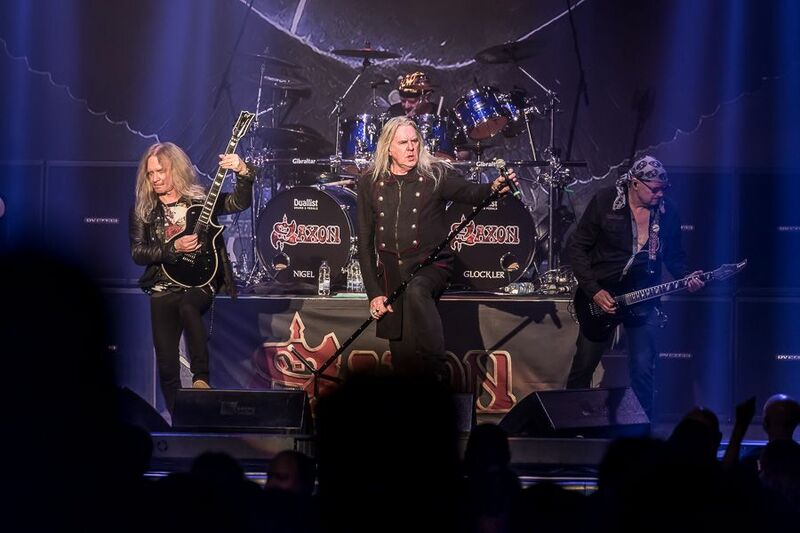 Saxon travels back to 1983 with the fist-pumping “Power and the Glory”. 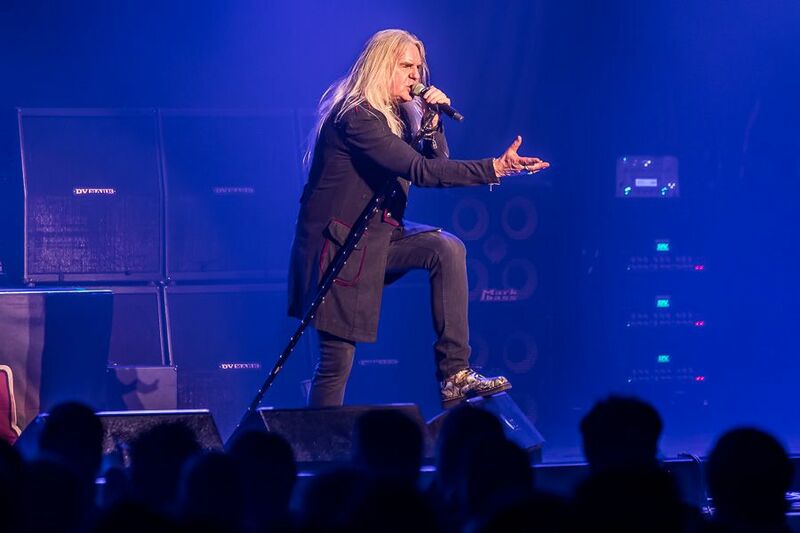 Biff Byford, the ultimate metal warrior leads the faithful with soaring vocals on one of the best songs off the new album “The Secret of Flight”. 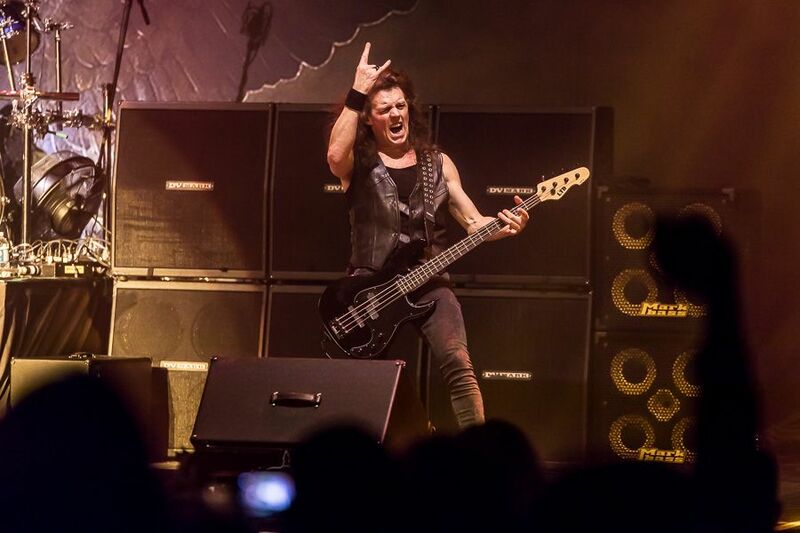 Nibbs Carter (bass) has to have the strongest and most enduring neck muscles in metal. Besides running around the stage, he whips his head around like turboprop propeller while laying down meaty bass runs on “Motorcycle Man” and “They Played Rock and Roll”. 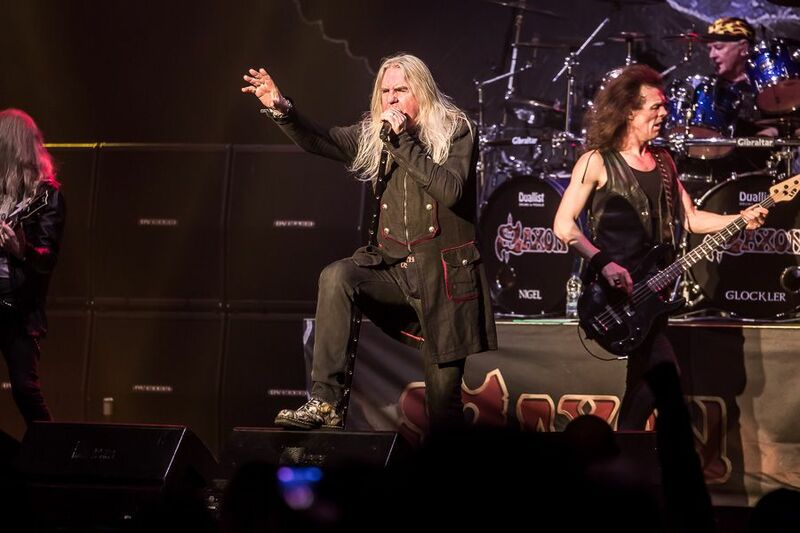 Guitarists Doug Scarratt and Paul Quinn are at the top of their game all night, nearly stealing the show with their mesmerizing solos on “Nosferatu (The Vampires Waltz)” from the Thunderbolt album. 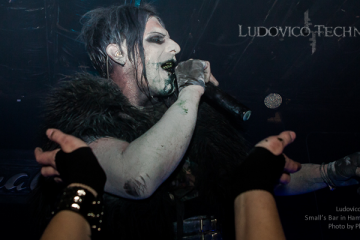 The shimmering guitar work makes this song burn with the fires of hell. 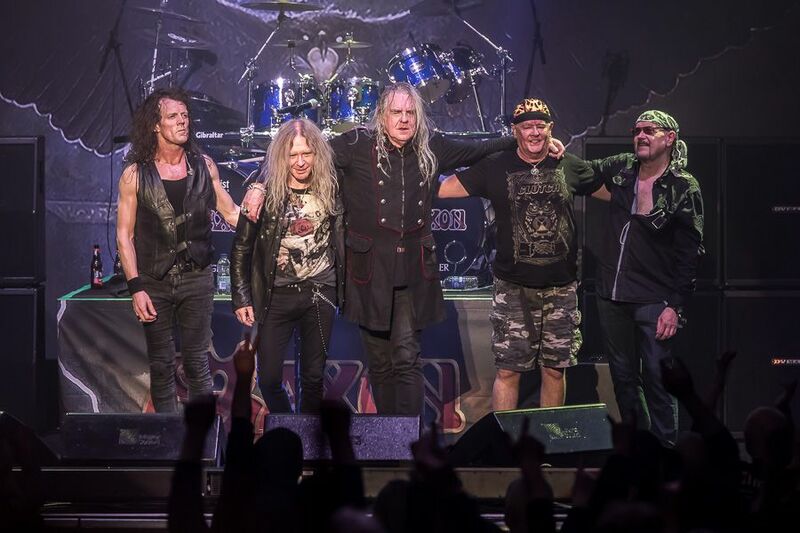 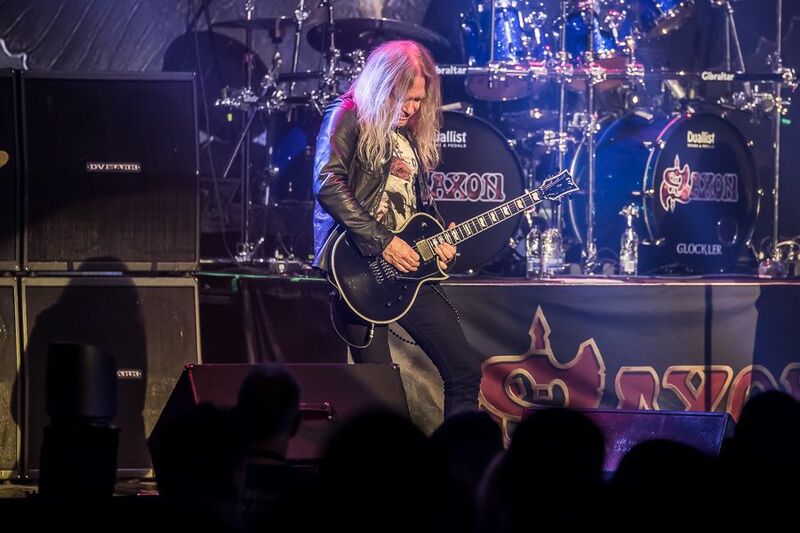 Fans marvel and cheer with gusto as Saxon keeps rolling out the classics such as “Denim and Leather” and “Princess of the Night”. 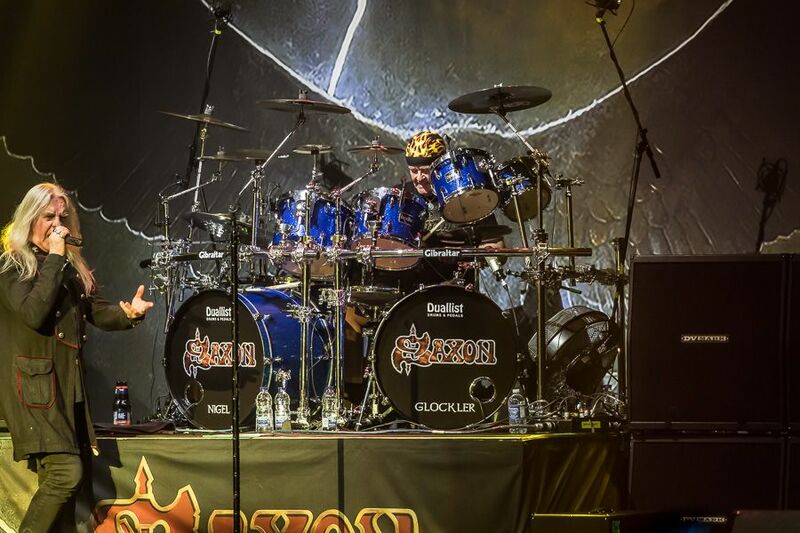 These songs sound best live especially when driven by the powerhouse drums of Nigel Glocker. 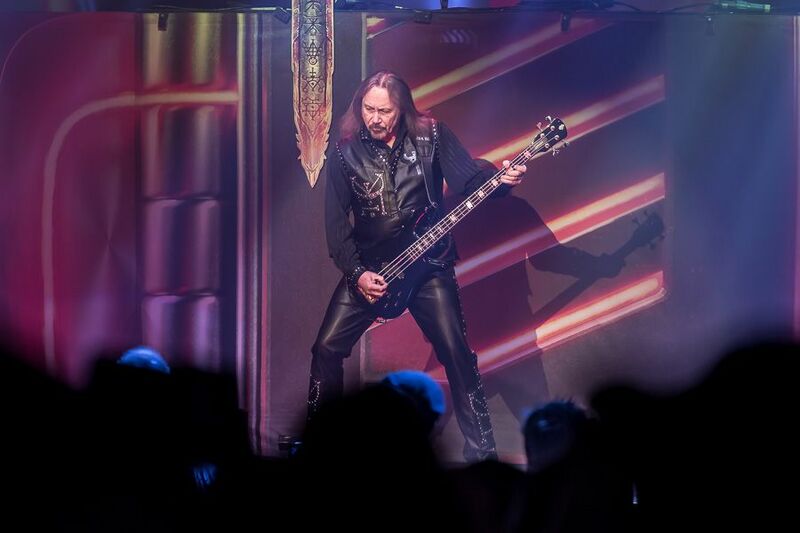 A glance at his face shows fierce determination as he brings the band home to close out their show with “Heavy Metal Thunder”. 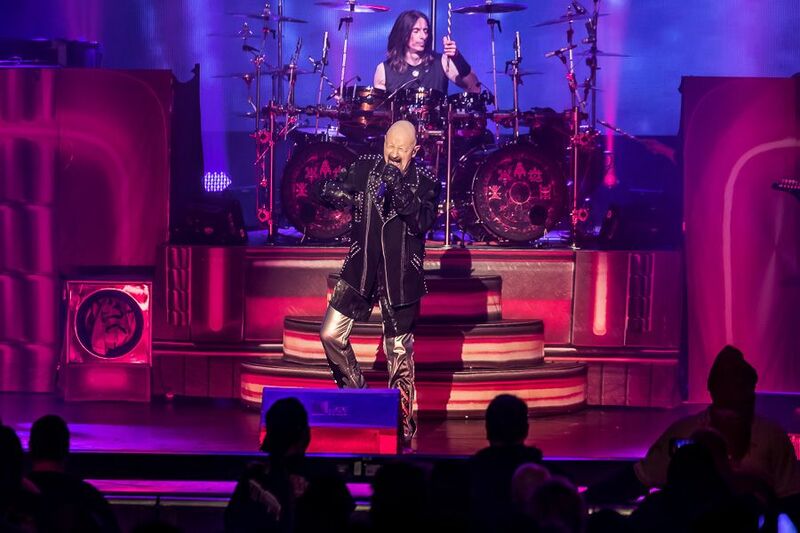 A red backdrop covered with Judas Priest lyrics and emblazoned with the rune inscribed symbol of Titanicus unfurls before the audience with shouts of approval and calls for “Priest!”. 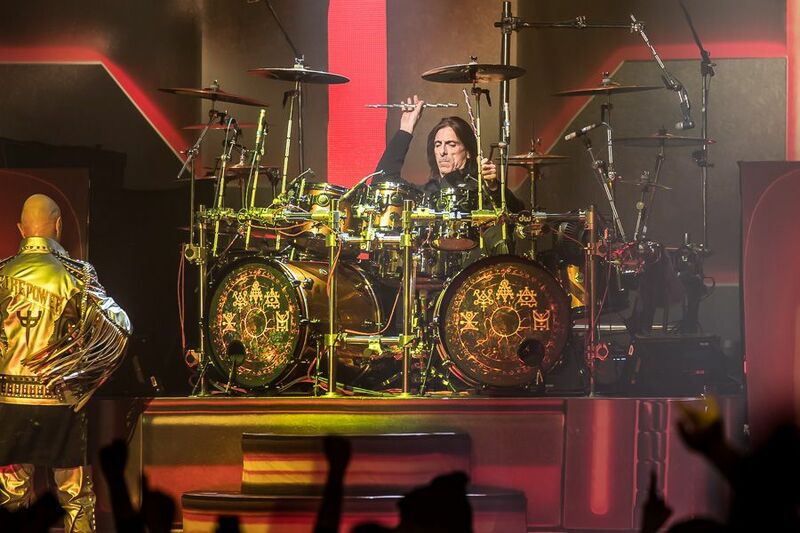 Black Sabbath’s “War Pigs” cranks through the house speakers and the crowd gets primed for action. 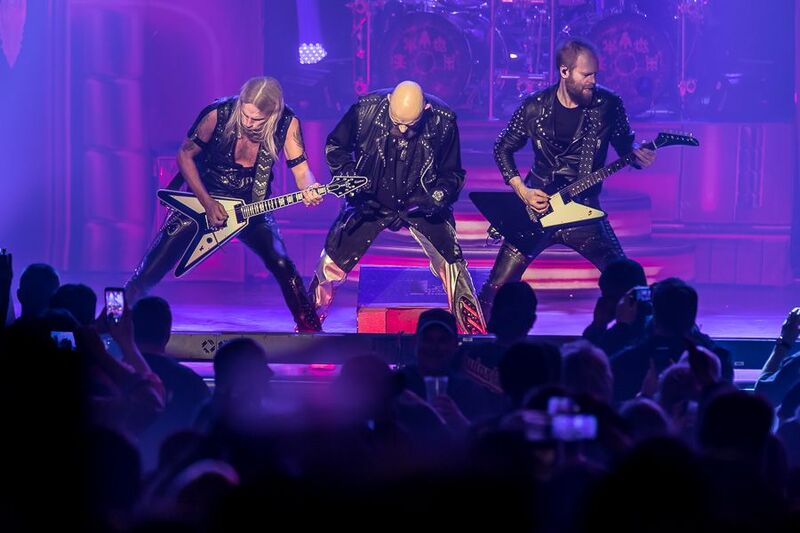 The roar of the crowd tries to match the volume from the stage as brief instrumental “Guardians” from the new ‘Firepower’ album heralds the arrival of Judas Priest. 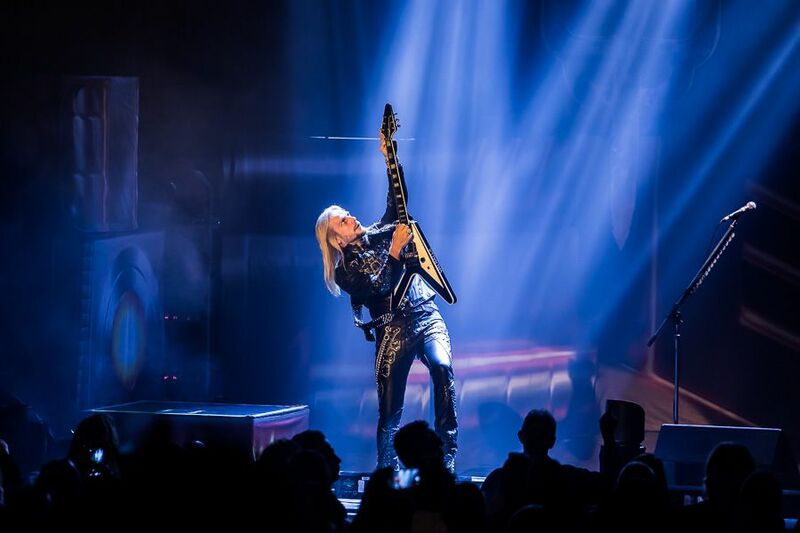 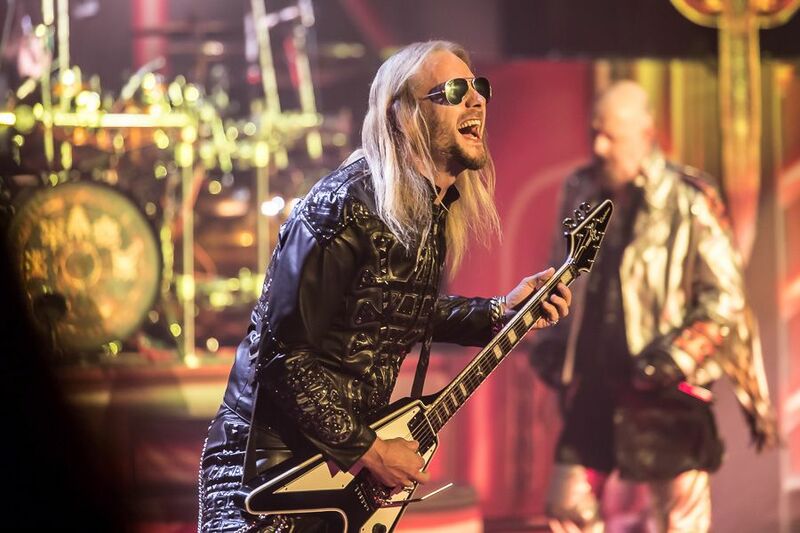 White hot spots beam down upon guitarist Richie Faulkner giving him the appearance of a space traveling metal warrior as he leads the band into “Firepower”. 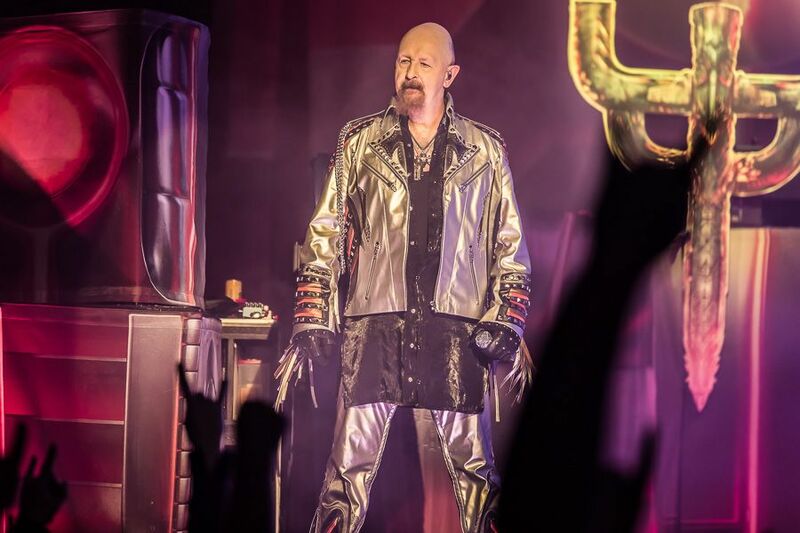 The metal god himself, Rob Halford cloaked in metallic jacket and pants, coils himself to deliver each verse before growling the chorus with strapping vigor. 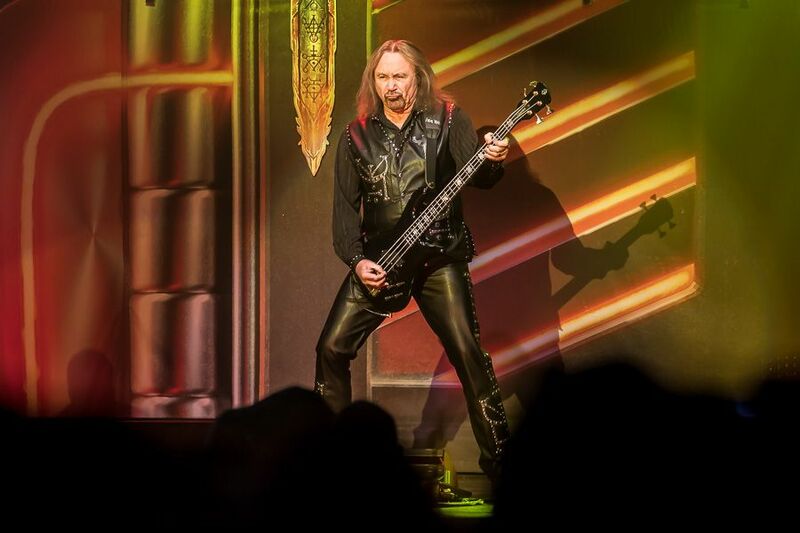 Stalwart bassist and linchpin to the Priest machine, Ian Hill takes root along the backline to hammer out the groove. 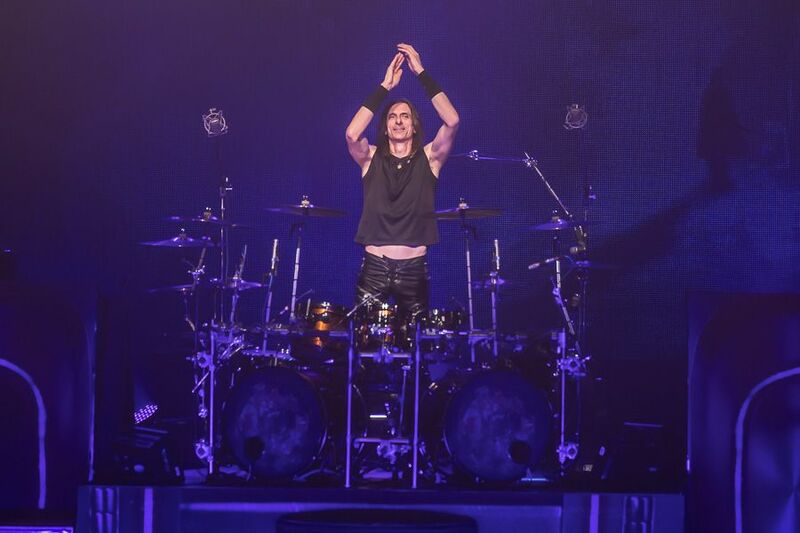 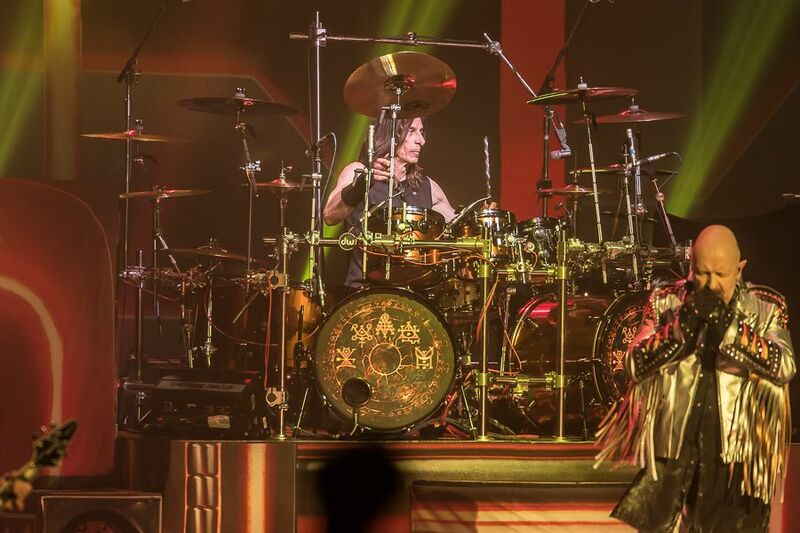 Drummer Scott Travis effortlessly keeps the band in time pummeling the double kick drums while tossing a stick into the air before bringing it down on the snare. 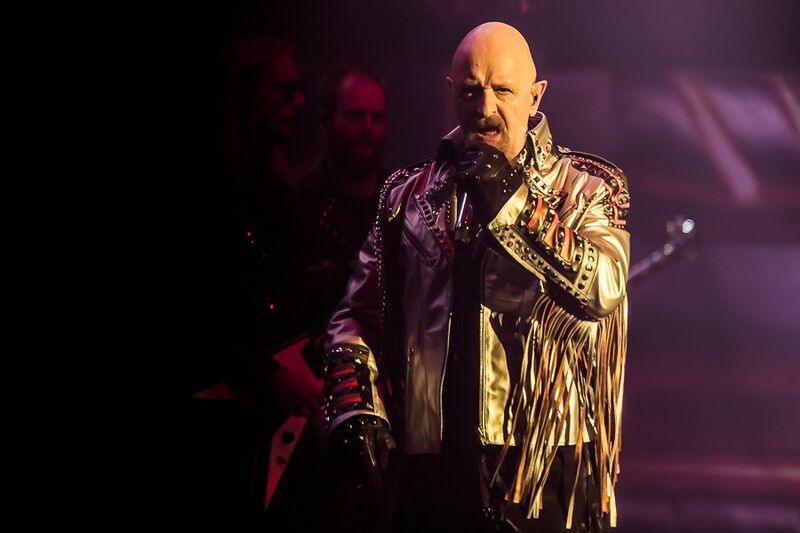 Judas Priest sound in top form as they send the crowd into a frenzy playing classic cuts “Grinder”, “Sinner”, and “The Ripper”. 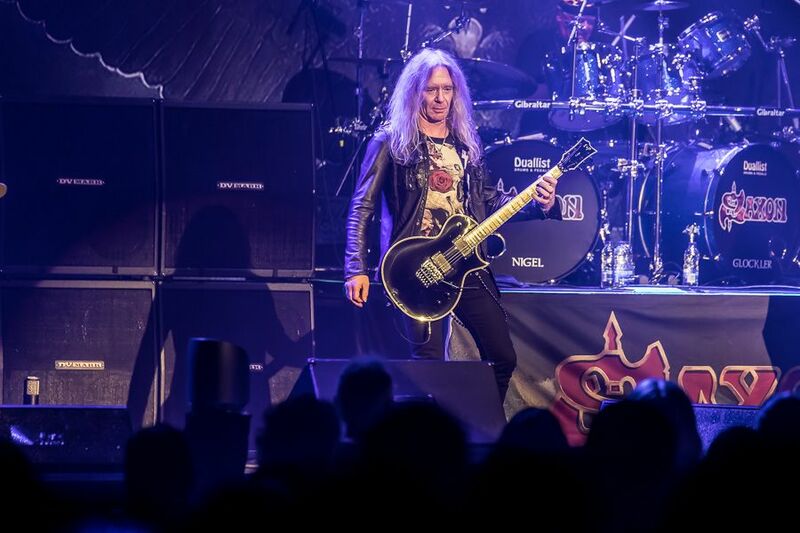 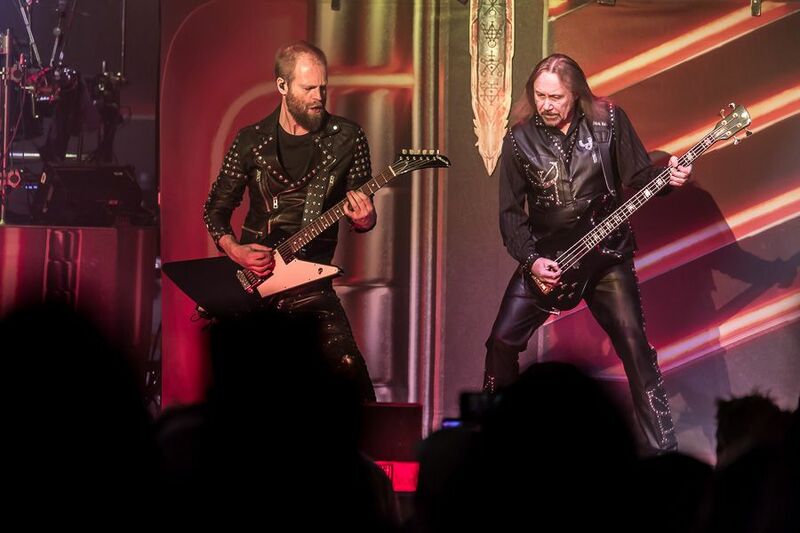 Touring guitarist Andy Sneap does an excellent job of filling in for the mighty Glenn Tipton. 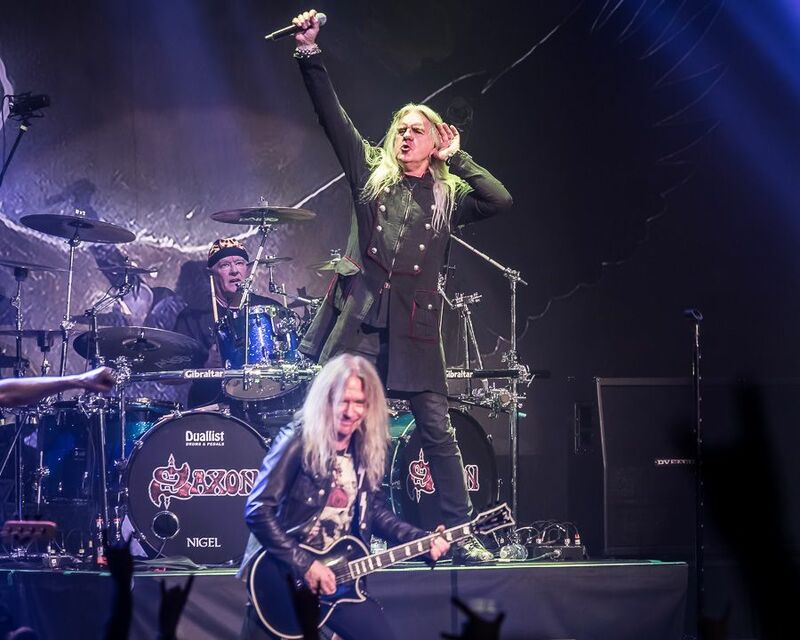 While Richie Faulkner appears to take more of the technical solos which Tipton would have played, Sneap is no slouch playing some tasty leads on “Green Manalishi”. 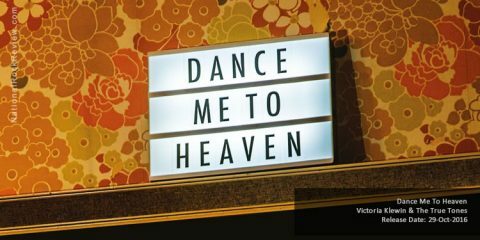 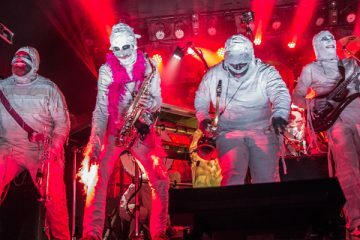 Adding to the musical barrage is a monstrous light show and wonderful backdrop imagery, much of which is finely tuned to the subject matter of each song. 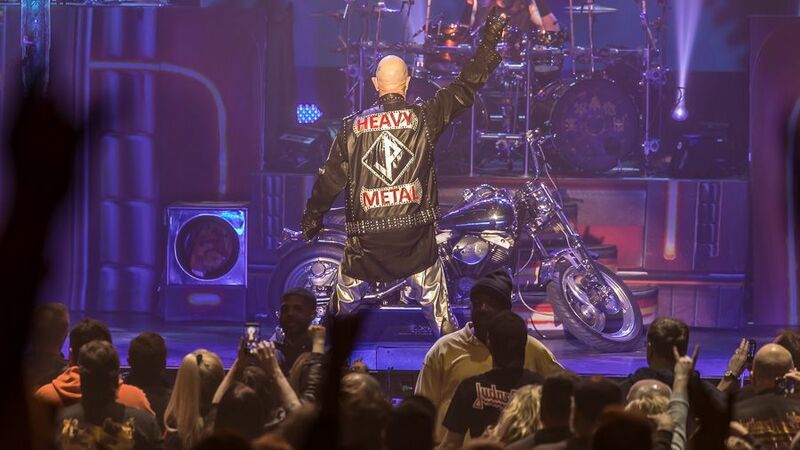 Rob Halford exits the stage between songs to put on a new jacket to fit in with the musical theme. 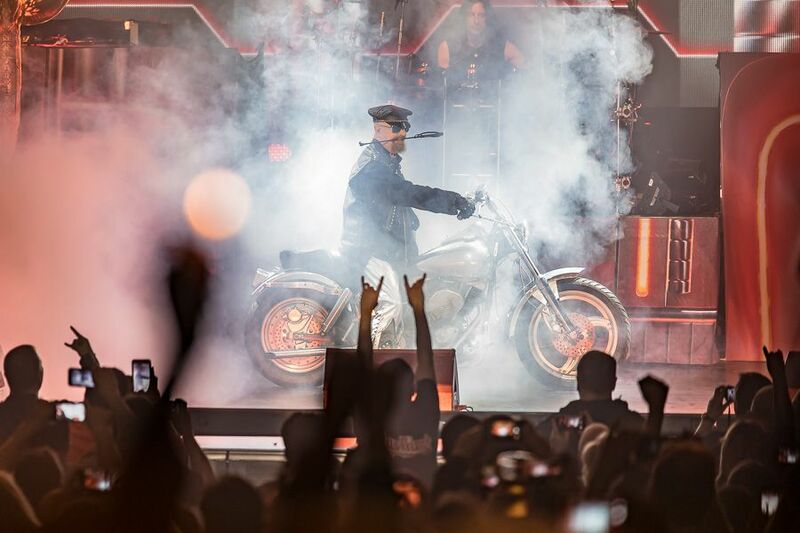 This culminates with him riding out on a motorcycle with a riding crop in his mouth as the band revs up the beast with “Hell Bent For Leather”. 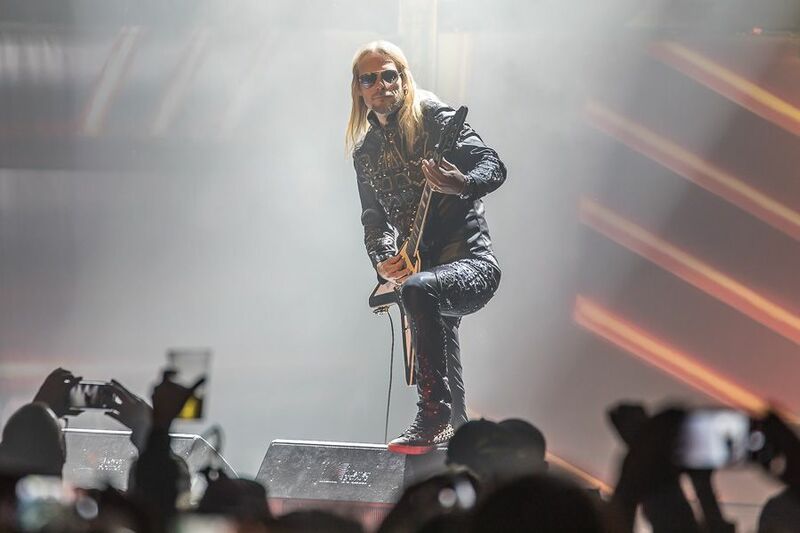 The highlight of the evening comes as gigantic images of Glenn Tipton with is trademark angular Hamer GT cascade across the backdrop to the blistering “Painkiller”. 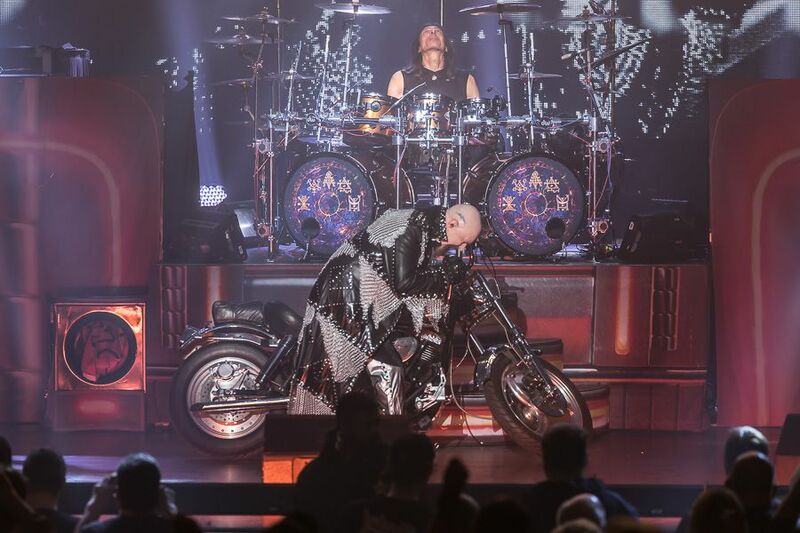 Priest takes just a short break before lavishing the adoring audience with an encore which includes “Electric Eye”, “Metal Gods”, and of course their anthem “Living After Midnight”. 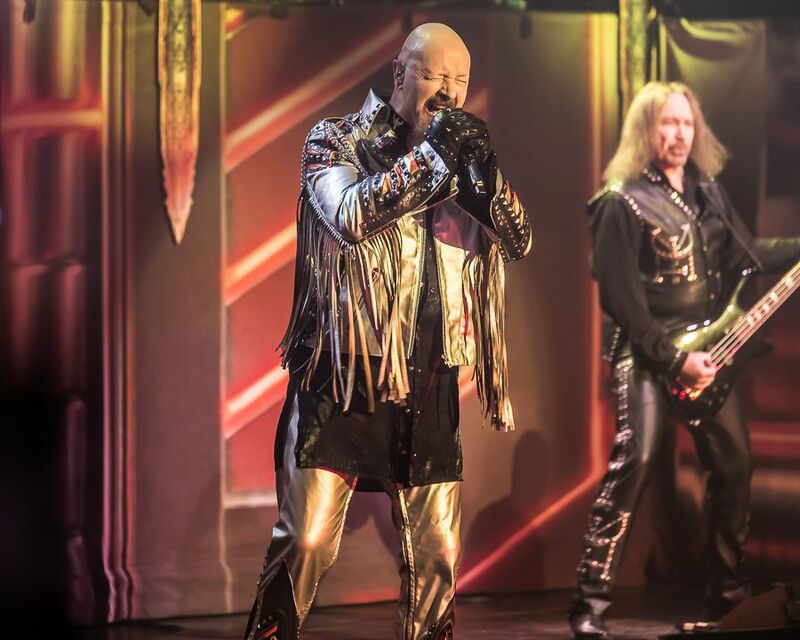 Judas Priest are back with a vengeance. 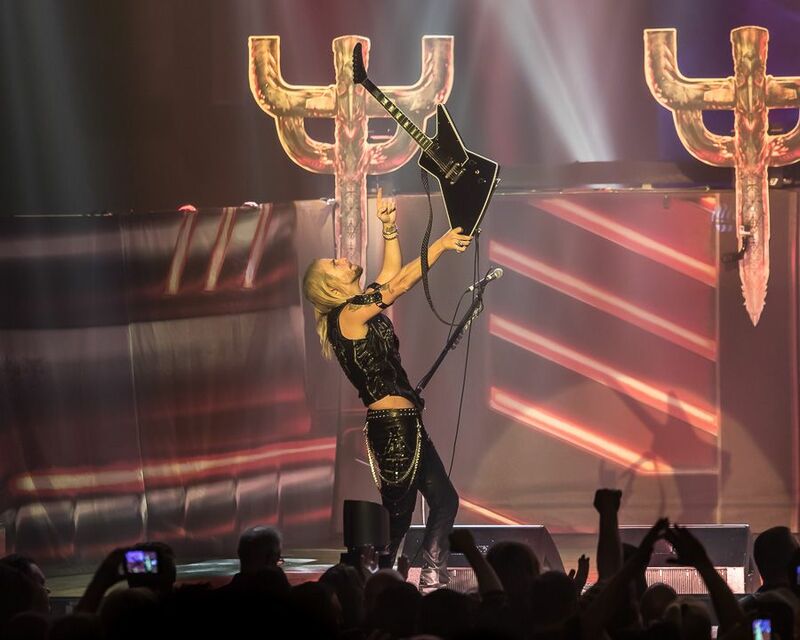 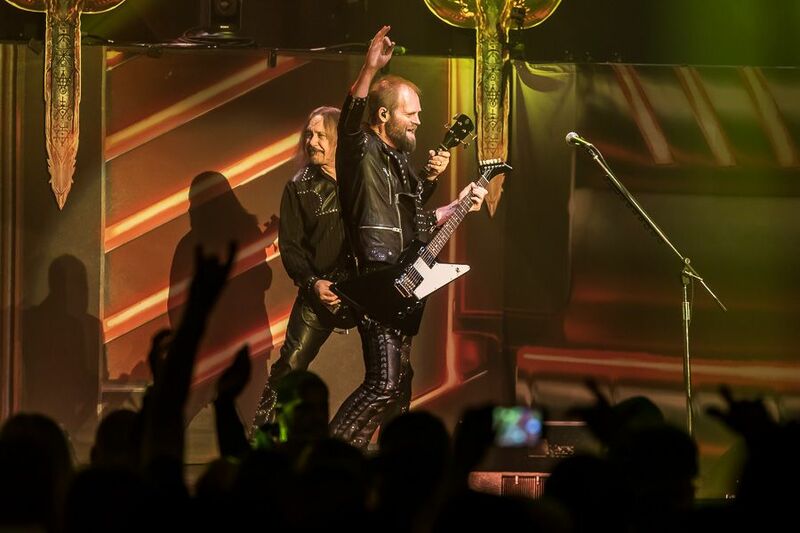 This evening with Judas Priest along with guests Saxon and Black Star Riders captures everything fans love about heavy metal music with soaring vocals, blazing guitars, crushing rhythms, and a bigger than life stage show.